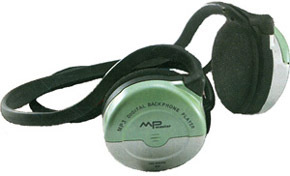 Why can't the manufacturers of flash memory based MP3-players sit quietly? Everybody has already acknowledged that those devices are the most compact and can't be outperformed on this parameter. However, they try to make players still more functional and less in size. It was this year summer when we tested some flash players. In that article I mentioned that I&C company had released the smallest player and was going to beat this record. And just right in the autumn the Korean firms incorporated in the headphones not only MP3-player, but even FM-radio! Well, this nonordinary player is called I&C MPMaster IM-600B. Nothing unusual in this player - the principles of work here are similar to those of MultiMediaCard based players. The only difference is that there is only one slot for MMC, instead of 2. It's a bit disappointing - you'd have to change the card more often. On the other hand, with the previous model release the most popular were 16 MBytes cards, and 32 MBytes only started appearing. Now 32 megs are easy to purchase, 64 megs will soon start to be ordered. Besides, some manufacturers are starting to release 128 MBytes MM card versions. That's why one can use just one slot (though two are better). Unlike 100WP, 600B doesn't support 3D-audio. Though, the most manufacturers use just an ordinary stereo. No new types of files have recently appeared: as usual, there are MP3-files with constant or variable bitrate (from 8 to 320 KBytes/s). It's not that bad though, but the support for WMA would be much better, and firmware upgrade possibility for any standards. What are other pros and cons of high compactness? Its small form has caused some inconvenience when handling. 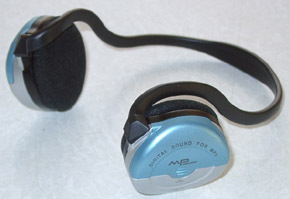 The manufacturer had to limit himself to only two buttons (Play/Stop and next track), which are located on the left headphone. The only playback mode is cyclic. Besides, there is an analog volume control (again on the left headphone). As for LCD, it was absent on the previous model, and this one undoubtedly doesn't need it. That's why you have to handle the player orally and by touch only. Audio quality has nothing to be ashamed of. Besides, we can't compare IM-600B with other players, since the headphones are different (there is neither input nor output). Of cause, there is no limit when improving the quality - they may include both EQ and 3D-audio, but there is just no place for it. Power supply is perfect. 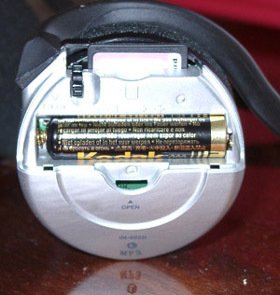 A battery (or rechargeable one) of AAA type is put in the headphone. According to the manufacture, the working time constitutes about 4-5 hours, though with a good alkaline battery you will be enjoying the songs 10 hours successively. The player is switched off automatically if there is nothing to play or if you switch the radio. This one includes a FM-radio, the characteristics of which are standard for this class. A radio station may be received if it's in the range between 87.5-108 MHz (though nothing has said about the increments). There is a similar model for Japanese market with a bit shifted FM-range. The radio offers just 2 buttons: search and reset. The manual adjustment is absent. No displaying. So, you might have some troubles while adjusting your receiver. The radio doesn't have an automatic switch off. So, if don't use it, you have to switch the player and then switch off the device. Beside the volume control, the radio and the player have separate power supply. FM-receiver requires one Li battery of CR2450 or CR2032 type (the latter has to be put inside with the supplied adapter). How long it's "alive", the manufacturer doesn't tell us. Similar to other MP3-players MPMaster IM-600B ensures good MP3 playback and quite ordinary, moderate radio quality. I understand that it's a cost of the diminutiveness (especially in case of IM-600B, where an antenna is just a 20 sm band between ears). But receivers of cassette players have the quality much better. That's why there is much to be improved. I&C doesn't share a point of view of those companies which prefer to ship complete sets (a player, a recording device, some memory cards for models without the integrated one). The company produces and ships players and recording devices as separate products believing that vendors would compile a complete set for a user much better. However, today there is just one recording device - MPMaster AK-10WP. Its software is similar to the previous model from I&C we described. The device is intended to be connected to a parallel port. The software has a serious drawback - it doesn't run under Windows NT4/2000. Nevertheless, a separate shipping has its merits: the recording device can be of any kind. I&C didn't invent its own recording format. It uses a standard for MMC file system - FAT/ROS. Nowadays we can see more and more MMC recording devices of different firms with different features. That's why it makes no sense to buy the standard recording device. Besides, if you are a user of a PDC (i.e. Cassiopeia EM-500), you need no recording devices since your hand-held computer possesses USB-interface and a slot for MMC. In my opinion the headphones are working without any troubles. At least for MP3 playback and FM-radio they are quite enough. Then, with the huge size they are worth respect (the bigger the size is, the higher quality should be). The headphones fit my head perfectly (I guess, you won't be less satisfied with it). The only that disturbs me is when I lean my head against a back of a chair. In this case, the headband moves the ear cushions forward. Besides, you can't wear them together with the glasses, though any head-dress wouldn't prevent you from wearing them :)). If you are annoyed with the color of your headphones, you can change it: there are 3 different plastic covers: blue, pink and green. It's also useful, if the covers break. Unfortunately, you have to open them quite often, i.e. just to change a card. Comparing with other similar devices, MPMaster IM-600B has a lot of lows caused by the minute form. But the compact design is its major great advantage: you can consider that it takes no place at all ;) That's why we can recommend it for those who go in for sports, or if you have just no place but for headphones. Besides, some get annoyed with the cable connecting the upper unit and the lower one.